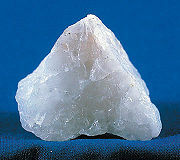 Chalcedony Any cryptocrystalline quartz, although generally only used for white or lightly coloured material. Otherwise more specific names are used. Onyx Agate where the bands are straight, parallel and consistent in size. Aventurine Translucent chalcedony with small inclusions (usually mica) that shimmer. Tiger's eye Fibrous quartz, exhibiting chatoyancy. Quartz is one of the most common minerals in the Earth's continental crust. Pure quartz is made of crystallized silica (silicon dioxide, SiO2), but in nature it occurs in many varieties based on the presence of small amounts of other substances. Historically, different varieties of quartz—such as agate, amethyst, onyx, and tiger's eye—have been used as gemstones. Today, quartz crystals are commonly used to make "oscillators" that keep track of time in wristwatches, provide a stable clock signal for digital integrated circuits, and stabilize radio transmitter frequencies. In addition, synthetic fused silica is used for various purposes, such as to make the envelopes of halogen lamps, the sheaths of electric elements, and the precision mirrors of telescopes. Specially prepared fused silica is used in the photolithography process of making semiconductor devices and is the starting material for optical fibers for the telecommunications industry. Roman naturalist Pliny the Elder (23–79 C.E.) believed quartz to be permanently frozen ice. In support of this idea, he said that quartz is found near glaciers in the Alps and that large quartz crystals were fashioned into spheres to cool the hands. He was aware of the ability of quartz to split light into a spectrum. The study of quartz by Nicolas Steno (1638–1686) paved the way for modern crystallography. He discovered that no matter how distorted a quartz crystal, the long prism faces always made a perfect 60-degree angle. Charles B. Sawyer invented the commercial quartz crystal manufacturing process in Cleveland, Ohio. This process initiated the transition from mined to manufactured quartz. Quartz occurs in hydrothermal veins (veins produced through hot water circulation) and pegmatites (coarse-grained igneous rocks). Well-formed crystals may reach several meters in length and weigh hundreds of kilograms. These veins may bear precious metals such as gold or silver, and form the quartz ores sought through mining. Erosion of pegmatites may reveal expansive pockets of crystals, known as "cathedrals." Tridymite and cristobalite are high-temperature polymorphs of silica (SiO2), occurring in silica-rich volcanic rocks. Lechatelierite is an amorphous silica glass, which is formed by lightning strikes in quartz sand. In the pure form, quartz crystals are colorless. On the other hand, the presence of "impurities" (small amounts of other substances) generates many varieties of quartz, including agate, amethyst, carnelian, chrysoprase, flint, jasper, onyx, rock crystal, smoky quartz, and tiger's eye. Some types of quartz have a "macrocrystalline" structure, in which individual crystals are visible to the unaided eye, while other types of quartz have a "microcrystalline" or "cryptocrystalline" structure, in which aggregates of crystals are visible only under high magnification. The cryptocrystalline varieties are translucent or mostly opaque, while the transparent varieties tend to be macrocrystalline. Chalcedony is a generic term for cryptocrystalline quartz. Historically, many of the varietal names arose from the mineral's color. Current scientific naming schemes, however, place greater emphasis on the mineral's microstructure. Not all varieties of quartz are naturally occurring. Prasiolite, an olive-colored material, is produced by heat treatment, but natural prasiolite has been observed in Lower Silesia in Poland. Citrine occurs naturally, but the majority is produced by heat-treatment of amethyst. Also, carnelian is widely heat-treated to deepen its color. 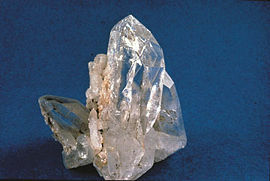 Natural quartz is often "twinned"—that is, two crystals intergrow and share some of their lattice points. For this reason, much of the quartz used in industry is synthetically produced, by what is called a hydrothermal process. This process generates large, flawless, untwinned crystals. Quartz has a hexagonal crystal structure made of trigonal crystals of silicon dioxide (SiO2, or silica). The typical outward shape of the crystal ("crystal habit") is a six-sided prism that ends in six-sided pyramids. The naturally occurring crystals, however, are often twinned, distorted, or so massive that only part of the shape is apparent from a mined specimen. Additionally, the crystals may take the form of a bed, particularly for varieties such as amethyst, in which the crystals grow up from a matrix and only one termination pyramid appears. A quartz geode consists of a hollow rock (usually with a roughly spherical shape) containing a core lined with a bed of crystals. The density of quartz is 2.65 g/cm³. Its hardness (resistance to scratching) is rated as 7 on the Mohs scale of 1 to 10 (where 10 is the maximum value, assigned to diamond). A quartz crystal has a property known as piezoelectricity—which means that when mechanical stress is put on the crystal, or when the crystal is made to vibrate, it produces electricity. One of the earliest uses for this property of quartz was in making the pickup for a phonograph. Today, one of the most ubiquitous uses of quartz, based on its piezoelectric property, is to make "crystal oscillators" (often simply called "quartzes"). A quartz crystal oscillator is an electronic circuit in which the mechanical resonance of a vibrating quartz crystal creates an electrical signal with a precise frequency. This frequency is commonly used to keep track of time (as in quartz wristwatches), to provide a stable clock signal for digital integrated circuits, and to stabilize frequencies for radio transmitters. The crystal used therein is sometimes called a "timing crystal". The piezoelectric principle is also used in the quartz crystal microbalance, which can make highly accurate measurements of tiny changes in mass. Fused quartz, or fused silica, refers to types of glass containing primarily silica in amorphous (non-crystalline) form. Varying the manufacturing process produces different forms. A transparent form is made by melting pure, naturally occurring quartz crystals at around 2,000° C in an electric or gas-fueled furnace. Translucent and opaque forms are produced by melting high-purity silica sand in an electric furnace. The opacity is caused by tiny air bubbles trapped in the material. Synthetic fused silica is made from a silica-rich chemical precursor, resulting in a transparent glass with ultra high purity. Its optical and thermal properties are superior to those of other types of glass, and it has better ultraviolet (UV) transmission than most other glasses. Given its strength and high melting point (compared to ordinary glass), fused silica is used as the envelope of halogen lamps, which must operate at a high envelope temperature to achieve their combination of high brightness and long life. Likewise, translucent tubes are commonly used to sheath electric elements in room heaters, industrial furnaces, and other similar applications. The combination of strength, thermal stability, and UV transparency makes synthetic fused silica an excellent substrate for projection masks for photolithography—a process used in the fabrication of semiconductor devices. In addition, it is used to make lenses and other optics for the UV spectrum. Fused quartz has nearly ideal properties for fabricating precision mirrors such as those used in telescopes. Also, specially prepared fused silica is the key starting material for making optical fibers for telecommunications. Translucent fused silica is used to make crucibles, trays and other containers for use in high-temperature thermal processing. The material is chemically inert to most substances, including virtually all acids, regardless of concentration. Shocked quartz is a form of quartz with a microscopic structure different from that of normal quartz. Under intense pressure (but moderate temperature), the crystalline structure of quartz is deformed along planes inside the crystal. Under a microscope, these planes show up as lines called shock lamellae. Eugene Shoemaker (1928–1997) found shocked quartz in the Barringer Crater (near Winslow, Arizona) and concluded that it was produced by the impact of a meteorite. (Volcanic activity would not generate the pressure required.) He gained this insight after finding shocked quartz in craters produced by underground atomic bomb tests at Yucca Flats, Nevada. Shocked quartz is also found worldwide, in a thin layer at the boundary between Cretaceous and Tertiary rocks. This observation supports the view that the transition between the two geological eras was caused by a large impact. Queensland University of Technology Origin of the word quartz. This page was last modified on 19 June 2015, at 14:28.